Hakusan, Japan, November 27, 2013 – EIZO Corporation (TSE: 6737) announced the release of the RadiForce RX850, a 31.1-inch color LCD monitor capable of displaying 8 megapixels for multi-modality applications. The RadiForce RX850 is the successor of the RadiForce RX840-MG released last year, which was the first 8 megapixel monitor for multi-modality use. EIZO’s 8 megapixel monitors act as effective replacements for multi-monitor setups for a smoother, more user-friendly environment when viewing numerous medical applications at once on a single screen. This allows medical professionals to conveniently view images side-by-side without the obtrusive bezels typically found in a multi-monitor environment. The RadiForce RX850’s super high-resolution screen is capable of displaying 8 megapixels of information with an improved pixel pitch of 0.1704 mm, allowing users to view medical images in exceptional detail across its 31.1-inch screen. This makes it ideal for a variety of modalities including digital mammography, magnetic resonance imaging (MRI), and ultrasound. The monitor also offers an increased high contrast ratio of 1450:1 to accurately render finer details in high resolution images. The RadiForce RX850 guarantees 20,000 hours of usage time when used at the recommended brightness of 500 cd/m2 – twice as many hours as the previous model. Designed to take up significantly less space than its predecessor, the monitor allows 8 megapixels of detailed information to be viewed more easily across a smaller screen. To keep work space efficient, the monitor’s width, height, and depth were reduced by 149 mm, 97 mm, and 27 mm respectively – a 37% difference when compared with the previous model. The reduced screen size also contributes to less head and eye movement, making the RadiForce RX850 more suitable for comfortably viewing medical data. The thinner, black front bezels are ideal for viewing the screen in dark reading rooms, making it easier to focus on images, while the original white stripe design around the sides of the monitor presents a fresh, clean aesthetic to promote a comfortable, user-friendly environment. 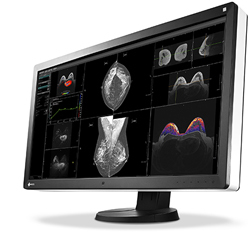 EIZO will be demonstrating the RadiForce RX850 at Booth #1735 at the 2013 Radiological Society of North America (RSNA 2013) from December 1-5 at McCormick Place in Chicago, Illinois (USA). The RadiForce RX850 will be available from May, 2014. Please contact the EIZO group company or distributor in your country for details.